Numerous media outlets often publish alarming articles about the dire state of the environment, but is this really the case? The answer to this is, unfortunately, an unambiguous YES! Even rudimentary research substantiates that the environment, in all its facets, is deplorably under severe threat and if the status quo is not halted and reversed, the end result will be disastrous for all who inhabit the planet. For the purpose of this article, environment refers, in a broad sense, to the surroundings, such as air, water, etc., inclusive of living things. ‘Environmental crime,’ on the other hand, refers to the illegal activities that cause damage to or harm the environment – this would typically include the illegal exploitation of the world’s wild flora and fauna, and pollution-related crime, which includes the trade and disposal of waste and hazardous substances in contravention of international legislation. The various byproducts of human activity, such as pollution, as well as human beings’ incessant thirst for natural resources that far outweighs supply, are the largest contributors to the current precarious state of the environment. By 2012 it was already estimated that the equivalent of 1.6 Earths were needed to provide the resources humanity consumes annually. An ‘overshoot day’ refers to the day each year when demands on the planet’s resources outstrips its ability to regenerate. More worryingly, the date on which the Earth goes into ‘ecological debt’ has been occurring earlier and earlier each year. This phenomenon first occurred in the 1970s, and to place this into perspective, some past overshoot days occurred on 24 December 1971, 5 November 1980, 13 October 1990, 25 September 2000, 14 August 2010, and 8 August 2016. A report by the World Wildlife Fund and the Zoological Society of London (October 2016) found that by 2020, the world’s populations of vertebrates will have dropped by 67% since 1970, and that extinction rates are currently 100 times higher than the natural extinction rate stemming from climate change, overfishing, hunting, and deforestation. This means that at the present rate of extinction, the world is facing its biggest mass extinction since that of the dinosaurs – two thirds of animals will be wiped out in 50 years from now! Leading scientists have warned that we are in the midst of the planet’s sixth period of mass extinction. Various aspects contribute to the environmental status quo. 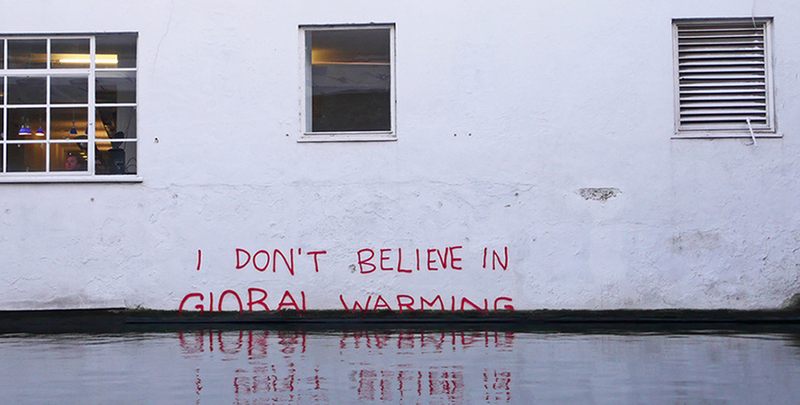 Climate change, for example, is considered a major threat, perpetuated by increasing anthropogenic pollution (i.e. pollution chiefly created through human activity), which could result in a two-degree Celsius temperature rise for humankind – some scientists say it is unavoidable. A notable example is that of the Bramble Cay melomy, a small, mouse-like rodent, which was the first mammal to become extinct due to anthropogenic global warming. Customs contributes towards mitigating climate change, and the WCO News (edition No. 81 of October 2016), which carried an article under the title “Global Warming, International Trade, and the Quantification of Carbon Emissions: Production-based and Consumption-based Accounting,” provides context to the carbon problem. Other species are, likewise, systematically killed-off and over-exploited, such as tigers, marine turtles, pangolins and timber trees, to mention a few. The international wildlife trade is regulated by the Convention on International Trade in Endangered Species of Wild Fauna and Flora (CITES). While a large proportion of the trade is legal, the rapidly increasing proportion of illegal trade in wildlife makes the disappearance of species nearly certain. The CITES Secretariat, after conclusion of the 17th meeting of the Conference of the Parties to CITES (CoP 17), held in South Africa in late 2016 and attended by 2,600 delegates from more than 160 countries, announced that as a result of the decisions taken by CITES Parties (member states), multiple new animals and plants were added to CITES Appendices for the first time, and will come under international trade controls, increasing the demand on frontline customs officers to intervene where necessary. Appendices I, II and III to the CITES Convention are lists containing over 35,000 species that are afforded different levels of protection from over-exploitation and international trade, where Appendix I lists species that are the most endangered and that cannot be traded internationally for commercial purposes, where Appendix II and III species can be traded under strict international controls. Following CoP 17, among the species that achieved a listing on Appendix I are all eight species of pangolin, the African grey parrot, the helmeted hornbill, and barbary macaques. In addition, the international trade for a substantial number of new mammals, marine and timber species, as well as many reptiles and amphibians, and also more than 350 species of rosewood, devil rays, silky sharks and thresher sharks, is now controlled. The attack on the environment is further perpetuated by the continuous production of harmful and waste products, such as plastics, medical waste, dangerous and toxic pesticides, radioactive waste, and even old cooling appliances that leak Ozone Depleting Substances (ODS). Toxic waste causes long-term poisoning of water and soil, which adversely affects peoples’ food sources and eventually their health. Every year more that 400 million tonnes of hazardous waste is generated, where a great proportion thereof is illegally shipped to and dumped in other jurisdictions. 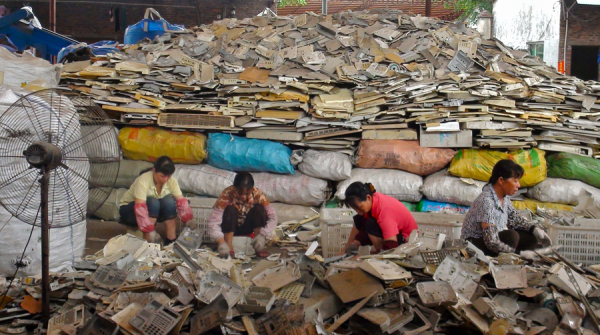 The United Nations Environment Programme (UNEP), for example, estimated that between 20 and 50 million tonnes of electrical and electronic equipment waste, also known as e-waste or WEEE, is generated annually – 70% of which is dumped in developing countries in Africa and Asia. © baselactionnetwork, Women sorting plastic waste, some of which will be melted down. The WCO shared with its readers in the February 2016 edition of this magazine the recommendations developed by a group of experienced professionals who participated in the Countering WEEE Illegal Trade (CWIT) Project, launched by the EU in 2013. There are also new developments regarding ozone depleting substances. The governments of 150 countries reached a compromised agreement in October 2016 to phase out Hydrofluorocarbons (HFCs), which will require the vigilance and dedication of Customs officers to ensure that legal trade is facilitated, and that illegal trade is combatted. HFCs were designed to replace chlorofluorocarbons and are widely used in refrigerants, but have recently been the subject of criticism as they are also highly potent greenhouse gases – more potent that carbon dioxide. Countries usually monitor the consumption of such products through a quota allocation system, product stewardship, compliance inspections, and a licensing system. Customs administrations are key actors in these control schemes as they are the ones largely responsible for collecting all the trade data needed to monitor and control the trade, and to detect and prevent any illegal trade. Detailed information on the subject is available on an article in the following page of this magazine. Ever increasing pollution, the unlawful disposal of waste, wildlife crime, illegal logging, and unreported and unregulated fishing, have all contributed towards a situation where a lukewarm approach is considered objectionable – the growing outrage and clamour for immediate action from all quarters of the globe is proof of this. But what can the WCO and its 180 Member administrations do to ensure a better tomorrow? Since 2003, the WCO has been an active partner, together with UNEP, to the Green Customs Initiative (GCI). The GCI aims to enhance the capacity of Customs and other relevant enforcement personnel to monitor and facilitate the legal trade and to detect and prevent the illegal trade in environmentally-sensitive commodities governed by the relevant conventions and multilateral environmental agreements (MEAs), covering ODS, toxic chemical products, hazardous wastes, endangered species, and living-modified organisms. In 2008, the WCO Council adopted a Recommendation concerning Actions Against Cross-Border Environmental Offences, in which steps to be taken by Customs administrations to enhance their capabilities in this area have been outlined. This was followed in 2010 by a decision by five international organizations, namely the WCO, the CITES Secretariat, INTERPOL, the United Nations Office on Drugs and Crime (UNODC) and the World Bank, to join forces to form the International Consortium on Combating Wildlife Crime (ICCWC). ICCWC’s mission is to strengthen criminal justice systems and provide coordinated support at national, regional and international level to combat wildlife and forest crime. The Consortium provides support to national wildlife law enforcement agencies, as well as to regional and sub-regional networks. In 2012, the ICCWC launched the Wildlife and Forest Crime Analytic Toolkit, which was developed to provide a comprehensive overview of matters related to wildlife and forest crimes, and aimed at government officials in wildlife and forestry authorities, as well as Customs and other relevant agencies. Although long involved in issues pertaining to the environment, the WCO, in response to its Members’ needs, decided to consolidate its activities with the launch of its Environmental Programme in 2012. The Programme aims to contribute to the combating of environmental crime, in particular, the illegal wildlife trade, the illegal trade in hazardous and other waste, ODS, and the illegal trade in timber. As Part of the Programme, the WCO also started implementing the activities of the Inama Project in 2014, which aims to strengthen Customs’ CITES enforcement capacity in selected countries in Sub-Saharan Africa. The continuous focus on illegal wildlife trade through training provided to Port Control Units (PCUs) created and trained under the Container Control Programme (CCP), developed jointly by the UNODC and the WCO, has, in addition, increased capacity within Member Customs administrations. These Units are currently fully operational in 34 countries. the CLiKC! platform, a WCO e-learning facility containing courses on environmental crime. The WCO also organised and coordinated a number of law enforcement initiatives and operations, which have also proven to be effective to test the enforcement capacities of some countries, identify modus operandi as well as to share information among countries. Having worked for many years to turn the attention of the policymakers to environmental crimes, the WCO gained additional momentum in June 2014, when the WCO Council unanimously adopted the WCO Declaration on the Illegal Wildlife Trade, which demonstrates the commitment of the global Customs community to address these crimes in a timely, coherent, and coordinated manner. The WCO also supports an initiative aiming at forging partnership with freight forwarders, logistics companies, land, air and sea carriers, including passenger airlines, who are being abused by traffickers in wildlife who depend on them to smuggle illicit goods from source areas to market destinations. The transport fraternity plays a critical role in being the eyes and the ears of enforcement agencies, helping to identify and strengthen key risks in the supply chain. In 2016, the WCO signed the United for Wildlife Transport Taskforce Buckingham Palace Declaration, the result of 12 month’s work carried out by leaders from the global transportation industry, conservation organizations and several international organizations, including the WCO. The WCO also pledged its support to the resolutions of the CITES CoP 17 which are mentioned earlier in this article, as well as to the Hanoi Statement on Illegal Wildlife Trade and hopes that countries’ commitment, especially those to provide financial support and technical support to initiatives aimed at developing capacity to tackle wildlife crime, will be implemented. In addition, it further bears mention that in 2015, the WCO worked closely with the CITES Secretariat to integrated the CITES Enforcement Authorities Forum with ENVIRONET. The Forum was a closed user forum that the CITES Secretariat used to reach out to the law enforcement community through the posting of various alerts, manuals, handbooks and enforcement-related messages. This is now part of ENVIRONET and the ENVIRONET library, where selected folders managed by the CITES Secretariat include copies of CITES Notifications on enforcement matters, alerts issued by the CITES Secretariat, CITES sample permits and certificates and other relevant materials and information. In addition, Customs has holistic knowledge and expertise in dealing with the legal transboundary movement of goods, as well as with illegal, or illicit trade and the actors involved. Global information and intelligence exchange networks are in place through which information, risk data, and intelligence are disseminated, and where infringements occur, Customs has the power to undertake physical controls, such as detentions, investigations, and seizures. In light of the above, it is imperative for Customs administrations to consider the gravity of environmental crimes, and ensure that such crimes receive the strategic recognition and operational attention that they deserve. Turning a blind eye to the myriad environmental threats that we face should not be an option, and it is requisite to reconsider what Customs can do in order to bring about a better environmental future for all. Interested readers may obtain source references relating to this article from the author, or the WCO Communications Service. ICCWC’s mission is to strengthen criminal justice systems and provide coordinated support at national, regional and international level to combat wildlife and forest crime. The Consortium supports national law enforcement agencies, assists in establishing wildlife law enforcement agreements, undertakes research into the causes, nature, scale and value of wildlife crime and related violations, and proposes innovative ways to prevent and discourage such crimes. In addition, the ICCWC supplies expertise and resources, jointly develops new capacity building material and tools, raises awareness on wildlife crimes and other related violations in the wider law enforcement community, and, where appropriate, seeks donor support to enable the provision of such services in the form of joint projects and programmes. The ICCWC Strategic Programme 2016-2020 outlines ICCWC’s comprehensive strategy and types of activities to be pursued by the Consortium up to 2020 based on funding availability and donor support. Pangolins: Conservationists warned of the devastating decline in pangolin populations. CITES followed up by putting all eight pangolin species, 4 found in Africa and 4 found in Asia, into Appendix I.
Grey parrots: The African grey parrot, heavily sought after for the pet trade, was moved to Appendix I. The birds are hugely popular around the world as pets, but their numbers in the wild have dwindled, with Ghana estimated to have lost 90-99% of its wild population. Rosewood: The explosion in demand – the market has grown by 65% since 2005, and is now worth 2.2 billion US dollars per year – is having a devastating impact on the forests in South-East Asia where the rosewood tree grows, and traffickers are now looking for sources in Africa and Central America. By a consensus decision, the CITES conference placed all 300 types of rosewood under Appendix II. Rhinos: A proposal from Swaziland that would have allowed it to sell its 330 kg stockpile of horn in order, it said, to use the money to help support rhino conservation work, was rejected. Lions: A motion to ban all trade in lion parts was defeated. The trade in wild lion parts will continue to be prohibited, but the hoped for ban on trade in captive lion parts did not materialize. Sharks and rays: A decision was taken to place all nine species of devil ray, three thresher shark species, and the silky shark in Appendix II, resulting in international trade restrictions to ensure their exports are sustainable and legal. Elephants and ivory markets: There was no change with respect to African elephants. Most populations remain in Appendix I, while the populations of Botswana, Namibia, South Africa, and Zimbabwe remain in Appendix II. However, a unanimous resolution was passed calling for the closure of all domestic ivory markets “that contribute to illegal trade and poaching.” China later announced plans to close down its own domestic market.